In the wake of an ever more divided political atmosphere, students often find themselves turning to the classroom setting to discuss politics. This discussion is one fraught with tension and conflicting viewpoints, and has thus left teachers with the responsibility to decide what role they want to play in these conversations: facilitator or participant? About 66 percent of Pali students have had a teacher directly express their political views in class, according to a recent Tideline Schoology survey of 445 students. And in the wake of the 2016 election, this commentary has increased, according to 75.5 percent of responders. A central concern about teachers openly expressing their opinions is the potentially adverse effect on a student’s learning experience if they feel alienated because their opinion differs from that of their teachers or classmates. A political disagreement between a teacher and a student has the potential to disrupt the main function of a school: to serve as a safe educational environment whose primary focus is academics. Since teachers are in a position of power over students, many students may silence themselves on issues because it conflicts with a teacher’s. Additionally, a student who is uncomfortable with a teacher’s political commentary cannot simply leave the classroom. However, many students and educators feel that political discussion is essential to the educational experience. It broadens students’ intellectual horizons by exposing them to new ideas and encouraging civic engagement. And discussing politics in class can expose students to political views besides those of their parents. The political discussions at Pali may not be so varied in viewpoints, however. According to the Los Angeles Times, over 70 percent of Pacific Palisades residents voted for Hillary Clinton in the 2016 presidential election, and Pali’s general political attitude leans left in both the faculty and student body. The neighborhood’s pervasive liberal atmosphere could have a dual effect of both sheltering already liberal students from new opinions while simultaneously further alienating conservative students because they have few similarly-minded teachers and students to turn to. Some students are bothered by their community’s liberal political views. Last semester. Pali’s Conservative Club suggested a bill of rights that expands on the Student’s Bill of Rights and Responsibilities, emphasizing student freedom of speech and the need for teachers to remain neutral about politics. “As someone who supports free speech, I think the school should be open to all students to discuss their kinds of ideological opinions; however, the teachers should remain neutral and respect everyone’s like any good moderator,” junior Jack Lehrer, a member of Pali’s Conservative Club, said. Nonetheless, most students surveyed said that it was appropriate for teachers to discuss politics in a classroom setting. On the other hand, History Department Co-Chair Christopher Berry said that it is not the job of teachers to state their political views — with the exception of a few situations. “For the most part, we need to remain objective and help students understand the conflicting sides or perspectives in history and in the world, but should there be objectivity when it comes to a group like the Nazis or the violence in Charlottesville? I do not feel that it is inappropriate, for instance, to criticize and call out the Nazis or the Confederacy,” he said. The legal standing on teachers discussing politics is complex. Though the 1968 Supreme Court case Pickering v. Board of Education ruled that the First Amendment gave teachers the right to discuss issues of public importance, this has not always been upheld. In 1996, California courts upheld the rights of San Diego schools to bar teachers from wearing political buttons, setting a precedent of allowing the restriction of teachers’ free speech rights in regards to politics. And many factors show that despite the promise of First Amendment rights, punishment for speaking politically may still befall teachers. In Garcetti v. Caballos in 2006, the Supreme Court ruled that government employees are not protected by the First Amendment when they speak as public officials. In 2015, the American Civil Liberties Union similarly stated that since teachers aren’t speaking as private citizens when in the classroom, their statements are considered on behalf the school district and are thus not protected by the First Amendment. There have been instances of legal consequences for political commentary among teachers. In November 2016, a teacher at Mountain View High School in Northern California was suspended for multiple days because of a lesson in which he compared the rise of then President-Elect Donald Trump to that of Adolf Hitler. This event shows the possibility of punishment which surrounds political classroom discussions. The controversy and high stakes of the current political climate also complicate the issue. Many of the issues that are considered political, such as the travel ban, directly affect the lives and rights of students. 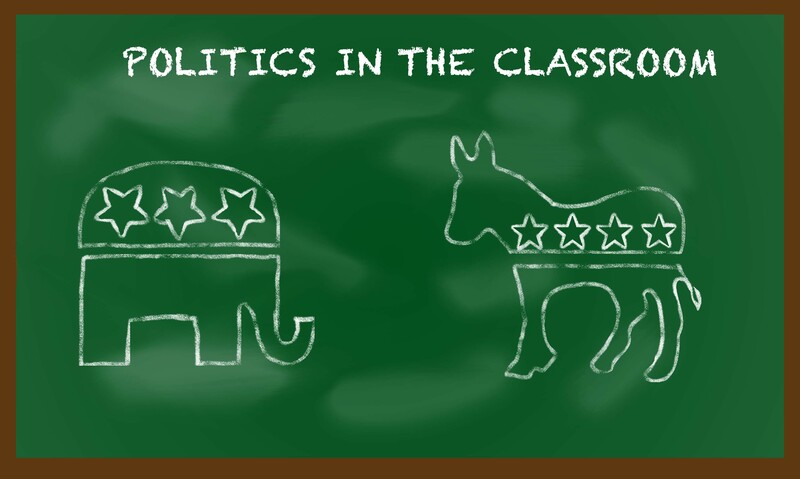 Avoiding bringing politics into the classroom can be a difficult feat in the current political atmosphere, and properly navigating these discussions to avoid blatant bias is equally difficult. This is a topic that light should be shed upon. I wrote a similar story, “Opinion Confronting political stereotypes” where students spoke out about exactly this. A classroom which should be a place of intelligent conversation, is oftentimes dulled by judgmental viewpoints, which is especially inappropriate when expressed by teachers. Thank you for this! I’m glad that you enjoyed the article! I’ll be sure to give yours a read!